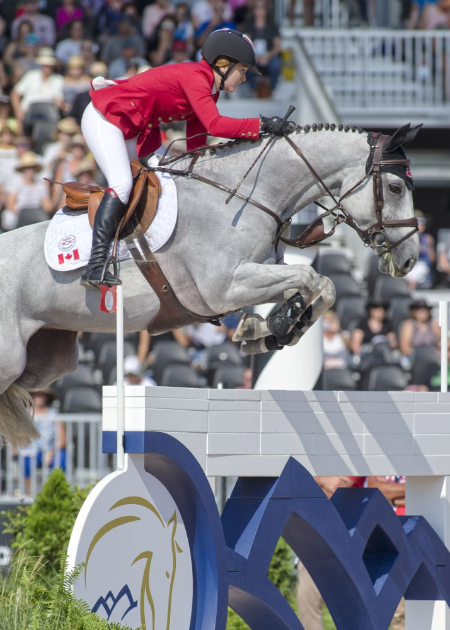 The Canadian Show Jumping Team rallied on the second day of team competition at the FEI World Equestrian Games™ Tryon 2018 (WEG) in Mill Spring, NC on Sept.20, 2018 to secure their spot as part of the top 10 moving forward to the Team Final. Following the opening speed phase on Sept, 19, the Canadians were holding 12th place. However, team members, Erynn Ballard of Tottenham, ON, Kara Chad of Millarville, AB, Mario Deslauriers of New York, NY and Eric Lamaze of Wellington, FL moved up to 10th on a score of 32.89 penalties after hard-fought rounds on day two. Set for Sept. 21, 2018, the Team Final has far more than bragging rights up for grabs. With WEG 2018 acting as an Olympic qualifier, the top six teams will earn their country’s berth to the 2020 Tokyo Olympics. Switzerland is holding the lead on 11.64, with the United States hot on their heels at 12.59. Germany is sitting third with 18.09. Currently leading the individual standings is Lorenzo de Luca of Italy on a score of 1.19 penalties aboard Irenice Horta. As per championship scoring, the fastest individual from the speed phase on the opening day of competition was awarded a perfect score of zero, with every other rider’s time being converted to penalties. However, for the second round, traditional show jumping rules were followed, with four jumping penalties applied for each rail lowered and each refusal, plus one time penalty added for every four seconds over the time allowed. Only three scores count toward the total with teams of four riders permitted to drop their highest score in each round of competition. 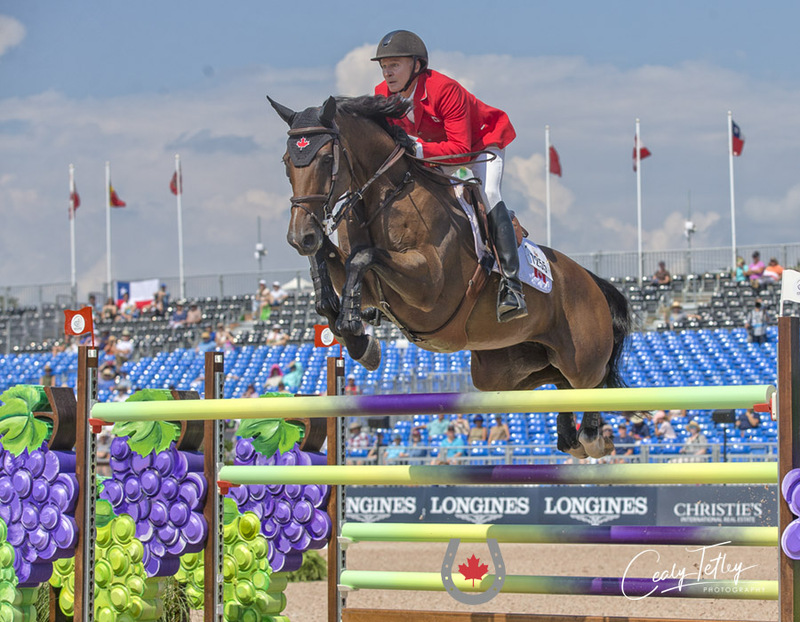 Chad, 22, was the top performer in the second round for Canada after taking on the ramped up track set by FEI 4* Jumping Course Designer, Alan Wade of Ireland. Only five of 122 starters were able to achieve a clear round over the 14 jumps and 17 efforts, which included triple and double combinations, along with highly technical distances between jumps. Riding in the first major games of her career, Chad was sailing home clear aboard Carona (Untouchable x Silverstone), an 11-year-old Dutch Warmblood mare owned by Lamaze’s Torrey Pines Stable, until she got to the final line on course — a tough technical question that caused rails to hit the dirt often throughout the day. The penultimate line consisted of a triple bar at fence 12 that led into a double combination at 13, before ending on a bending line to a vertical at 14. The distance between the triple bar and the double combination forced riders to choose between fitting in six tight strides, or taking the risk of flattening out in five strides. After crossing the timers just over the time allowed of 85 seconds, Chad added one time and four jumping faults to her score, bringing her two-round total to 10.48. This allowed her to leap over 30 spots up the individual standings from the speed phase and into 30th place. Eric Lamaze is partnered with Chacco Kid for his seventh consecutive FEI World Equestrian Games. Team anchor and 2008 Olympic Champion, Lamaze, 50, had one fence down in each of the combinations on course, but otherwise was fast and efficient to contribute a two-day total of 11.01 to the team aboard Chacco Kid (Chacco Blue x Come On), a 12-year-old Oldenburg gelding owned by the Chacco Kid Group. Erynn Ballard has had two strong performances at her inaugural major games aboard Darko’s Promise, a horse she has been riding for less than six months. 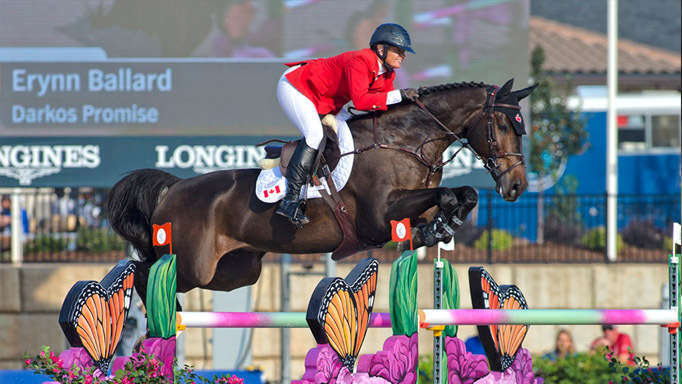 Canada’s pathfinder, Ballard, 38, once again showed her speed aboard Darko’s Promise, a 10-year-old Irish Sport Horse gelding owned by Ilan Ferder, coming in well under the time allowed in 83.23 seconds. After blazing through the first portion of the course, Ballard had a toe on the back rail of the oxer at fence nine for four faults. Like Chad and Lamaze, she also had a rail down in the difficult final line to bring the total to eight. However, unlike the majority, her rail came at the triple bar at fence 12 rather than the unlucky double combination at 13. In fact, she was the first rider of the day to come through the combination unscathed. Ballard ended the day in 39th place individually on a two-round score of 11.40. 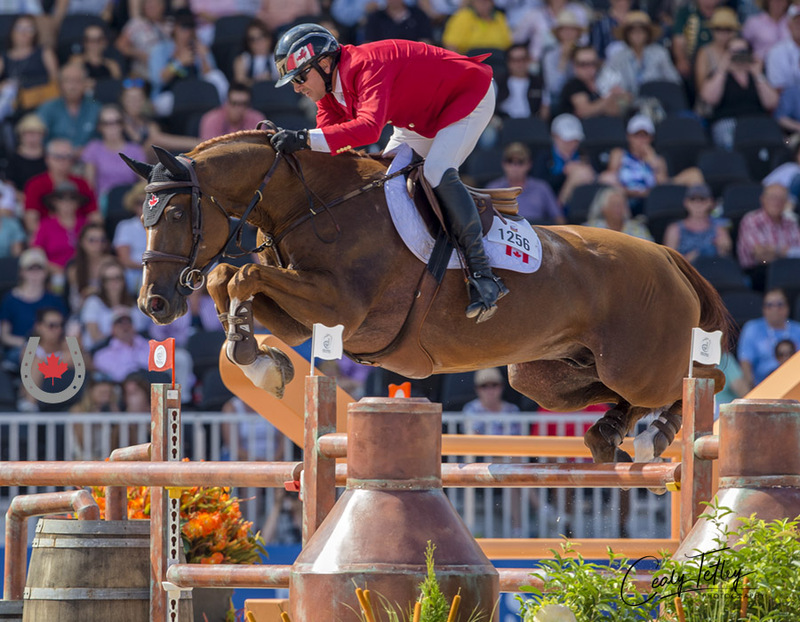 Two-time Canadian Olympian, Mario Deslauriers is partnered with Bardolina 2, who at nine years old is among the youngest horses in the WEG jumping competition. Deslauriers, 53, who is competing at WEG for the third time in his career, came into the final line on four faults after tipping delicate blocks off the top of the wall at fence three. He nailed the first two components of the line, opting to do five strides between the triple bar and the double combination. However, a moment of greenness from Bardolina 2 at the final fence on course, positioned in close proximity to the in-gate, added four more jumping and three time faults for a final converted score of 19.47. The top 10 teams and 60 best-placed individuals will take to the U.S. Trust Arena for the Team Final on Sept. 21. The individual medals will be decided on Sept. 23 with a two-round showdown. The top 25 will compete in Round A, with only 12 invited forward to Round B.